In December, Just Foods Program Director Michael Sligh retired from RAFI-USA after 29 years. We are grateful for his work and humbled by his incredible contributions. 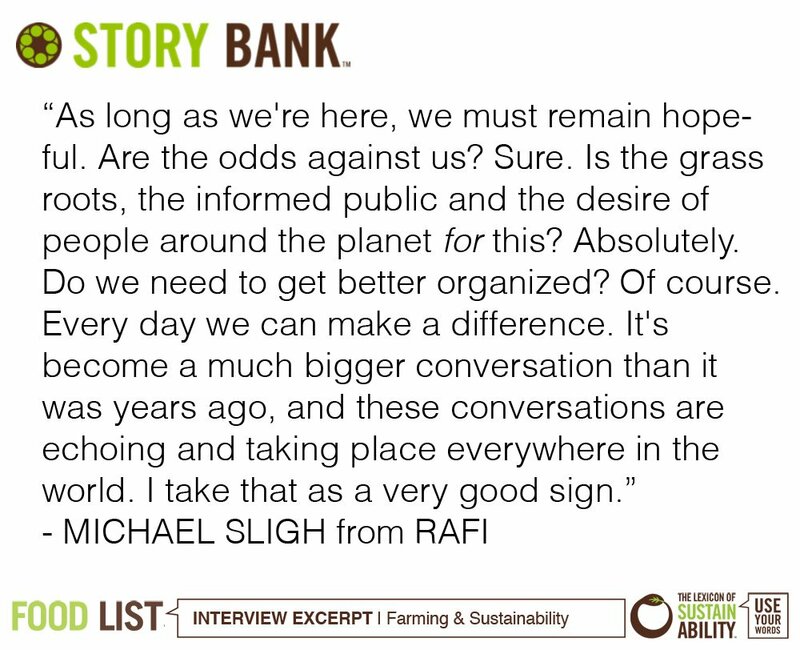 While at RAFI-USA, Michael’s dedication and vision for sustainable and organic agriculture has led him to pursue both domestic and international work and to partner with many different organizations and leaders in the organic movement. By talking with several of them, we were able to shed further light on his accomplishments thus far. As Michael moves on to continue the work in new ways, we hope to continue to collaborate with him. Kelli Dale has been working on the Just Foods Program with Michael for many years and will be the new Program Director. Michael comes from a long line of west Texas farmers and ranchers and left home in the 1970s to begin farming on his own in Tennessee, Florida and other places. While farming, Michael became acutely aware of the obstacles that family farmers face. Thus he applied for a job as an organizer. He often tells colleagues that he thought he would do this work for a couple years, fix the problems, then come back to the farm. Over the last 29 years at RAFI-USA, Michael has continued his work toward fixing the problems he saw. Michael has been RAFI-USA’s Just Foods Program Director since 1991, managing policy, research, and education regarding agricultural best practices, biodiversity, biotechnology, organic identity preservation, and a range of other food justice and value-added food labeling and marketing issues. Michael works in coalition on most everything he does. Colleagues and others we spoke with describe him as a “true organizer” and a key contributor to the development of many of the coalitions and infrastructure that has formed the sustainable agriculture and organic movements as they are today and allowed for the growth of the global organic marketplace. In this work, Michael prioritizes ingraining stakeholder input, accountability, and transparency into the structure of coalitions and programs to ensure their long term success and responsiveness to the communities they are intended to serve. 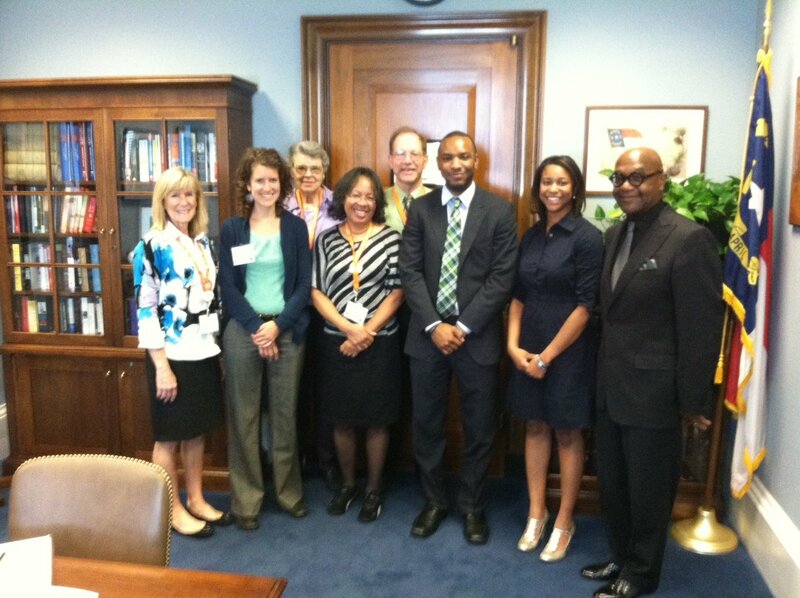 He was involved in the development of the Organic Foods Production Act (OFPA). When it was passed in 1990, it established the National Organic Standards Board (NOSB), a Federal Advisory Board to the USDA. Michael was Founding Chair of the NOSB and played a key role in development of recommendations that established the NOP. While most USDA programs have advisory committees, NOSB is unique in that it has responsibilities for the USDA’s development of organic standards and the National Organic Program. NOSB has statutory authority over the National List of Allowed and Prohibited Substances (what can and cannot be used in organic agriculture) and conducts peer review of the USDA’s accreditation. Michael remained in NOSB leadership until 1995. When the first rule was released for the National Organic Program in 1997, Michael (representing RAFI-USA) co-chaired the National Campaign for Sustainable Agriculture, Organic Committee along with Liz Henderson (representing the Northeast Organic Farming Association). Michael and others were clear that the proposed rule failed to meet the NOSB recommendations, which included many problems such as allowance for sewage sludge, genetic engineering, and radiation. In response, they led a national, multi-organization response during the rulemaking comment period which inspired 250,000+ comments against these issues. Not only were sewage sludge and the other issues successfully blocked, but their action campaign reinforced the integrity and authority of NOSB. One area that the final rule also didn’t provide was for fair pricing for farms and fair treatment and wages for farm workers so Michael and others led a stakeholder process to gather input and advocated for a stronger focus on social justice in organic. Michael, Nelson Carrasquillo, Liz Henderson, Richard Mandelbaum, Oscar Mendieta, Marty Mesh, and others created the Agricultural Justice Project (AJP). As a Founding Partner of the AJP, Michael contributed greatly to the creation of the Food Justice Certified label – recognized as the most extensive “gold standard” social justice label in the United States, broadening understanding of sustainability beyond the existing organic and green labels. This was developed through extensive input from farmers, farm workers, industry, and others. Michael continues to serve as an advisor to the Agricultural Justice Project. As many different food labels and fair- trade standards arose, Michael became a Founder of the Domestic Fair-Trade Association, an alliance of fair-trade labels which come together to set base standards and ensure integrity of social justice labels. Throughout his work on the organic rule as well as six Farm Bill cycles, Michael has also promoted structural mechanisms such as organic certification cost share and group certification which allow low wealth and smaller scale farmers to access the benefits of organic certification. Michael’s vision for social justice and fairness in sustainable agriculture extended beyond the U.S. and took him abroad to learn from and bring ideas from other countries to the U.S. In the late 1990s, Michael worked on the Greener Fields project, traveling to Europe to learn about eco labels, advocating for labeling efforts to serve farmers, and collaborating on the development of “Greener Fields: Signposts for Successful Eco-Labels,” published in 2000. He also participated in the Organic World Congresses, such as in Vancouver, Bangkok, and Italy, which brought together leaders working on fair trade and organic around the world to make recommendations on the IFOAM Organic Standard. Michael helped to organize a meeting the day before one of these convenings and invited people from around the world to discuss the first draft version of the Food Justice Standards. About 19 people RSVP’d but around 50 people from 40 countries showed up. This sparked new collaborations and led to greater incorporation of social justice and fair trade into the IFOAM Organic Standard. After the USDA established the National Organic Program, Michael traveled around the world to support the advancement of organic and advocated for the United States to have an Organic Action Plan like in other parts of the world. In 2010, the National Organic Action Plan was published. Since then, Michael has worked to implement the National Organic Action Plan with a unique capacity to understand both complex policy and the long view. Currently, Michael is a member of the International Organic and Sustainable Accreditation Board (IOAS), focused on developing global organic infrastructure. Michael was a farmer before he was a policy maker and continues to farm today. Michael has always kept farmers interests in mind and worked to effect policy that is responsive to farmers’ needs. In particular, he has continually advocated for farmers in the South. In the late 1980s, when the Sustainable Ag Research and Education Program (SARE) began at the USDA, Michael provided the southern perspective as SARE became a regionally-administered program. Ferd Hoeffner credits Michael with playing a significant role in developing Southern SARE and helping to bring the perspective of farmers and the rural South to the national conversation. When the Sustainable Agriculture Coalition (a predecessor to the National Sustainable Agriculture Coalition) developed in the 1980s, much of the organizing was focused on the Midwest. In 1991, Michael was part of the founding group of the Southern Sustainable Agriculture Working Group (Southern SAWG), which now operates in 13 states. Keith Richards, Michael’s successor as the Coordinator of Southern SAWG, described Michael’s dedication to ensuring Southern SAWG was inclusive in terms of the farmers and organizations involved. Michael was instrumental in representing the South when the five regional working groups joined to create the National Campaign for Sustainable Agriculture (NCSA) in 1994 as well as when the Sustainable Agriculture Coalition and NCSA merged to become NSAC in 2009. Michael has also been a strong advocate for farmers in the South through the Farm Bill and other policy initiatives for many years, traveling to D.C. frequently to meet with policymakers. Another of Michael’s passions is Seeds and Breeds, including campaigning for classical breeding, fighting to reinvigorate publicly-held seeds and breeds, and protecting agricultural diversity. Many people worked on related issues in different capacities, but Michael played a key role in developing “Seeds and Breeds for 21st Century Agriculture” as an initiative that brings together researchers, farmers, policy makers, and others. Another of Michael’s sayings was “We must find rest in our work.” Though we hope that retirement from RAFI-USA will allow time for Michael to pursue new organizing opportunities, we also hope that Michael will take some time to rest and appreciate his many years of service. Sligh, M., Toward Organic Integrity: A Guide to the Development of US Organic Standards, RAFI-USA, 1997. Kane, D., Lydon, B., Richards, K., Sligh, M., Greener Fields: Signposts for Successful Eco-labels, RAFI-USA, 2000. 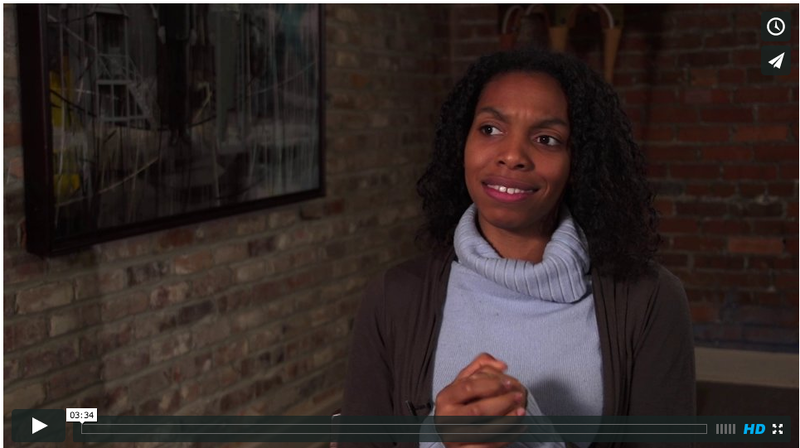 Sligh, M. Organics at the Crossroads: The Past and the Future of the Organic Movement. In The Fatal Harvest Reader: The Tragedy of Industrial Agriculture. The Foundation for Deep Ecology. 2002. Eco-Labels: Where do we go from here? Proceedings of the Greener Fields Forum, October 22-24, 2001, St. Louis, Missouri, 2002. The Organic Forum: A Big Picture Assessment, Girona, Spain, June 2002. Sligh, M. Christman, C. Who Owns Organic?”: The Global Status, Prospects, and Challenges of a Changing Organic Market. Rural Advancement Foundation International-USA. 2003. Summit Proceedings: Seeds and Breeds for 21st Century Agriculture. Ed. Michael Sligh and Laura Lauffer. Rural Advancement Foundation International-USA. 2003. Toward Social Justice and Economic Equity in the Food System: A Call for Social Stewardship Standards in Sustainable and Organic Agriculture, 2003. Sligh M., Moeller, D.R. Farmers’ Guide to GMOs. Ed. Krub, K.R. Farmers’ Legal Action Group, Inc., Rural Advancement Foundation International-USA, 2004. Hamilton, H., Sligh, M., The Changing Structure of Agriculture in the Southern United States, (LS95-85), Southern SARE, 2004. Social Justice Workshop, Bangkok, Thailand, November 3-5, 2003 Proceedings, 2004. Summit Proceedings: Summit on Seeds and Breeds for 21st Century Agriculture, Washington, DC, September 6-8, 2003, 2004. Crowell, Erbin and Michael Sligh, Domestic Fair Trade: for Health, Justice and Sustainability, Social Policy 37, (1).n.p. Sligh, M., Cierpka, T., Chapter 3, Organic Values, In Organic Farming; An International History, Lockeretz, W., Editor, CABI, UK, 2007. Sligh, M., Christman, C. Issues Paper: Organic Agriculture and Access to Food. International Conference on Organic Agriculture and Food Security. UN/FAO, Rome, Italy May 2007. Dumas, C.F., Schmitz, T.G., Giese, C.R., Sligh, M. Economic Implications of Plant-made Pharmaceutical Production in North Carolina. Rural Advancement Foundation International-USA, 2008. Sligh M., Hoodes, L. et al. National Organic Action Plan: From the Margins to the Mainstream, Advancing Organic Agriculture in the U.S. Rural Advancement Foundation International-USA, 2010. SAFA Indicators, Sustainability Assessment of Food and Agricultural System, Food and Agriculture Organization of The United Nations, Rome, 2013. Tracy W., Sligh M., Summit Proceedings: 2014 Summit – Seeds & Breeds for 21st Century Agriculture: Meeting the Challenges of Food Security, 2014. Sligh, Michael, A Call to Action: Addressing the “Bigger Picture” of GMO Contamination and Other Challenges in Organic Food, Feed and Fiber Supply Chain. Rural Advancement Foundation International-USA, 2017. 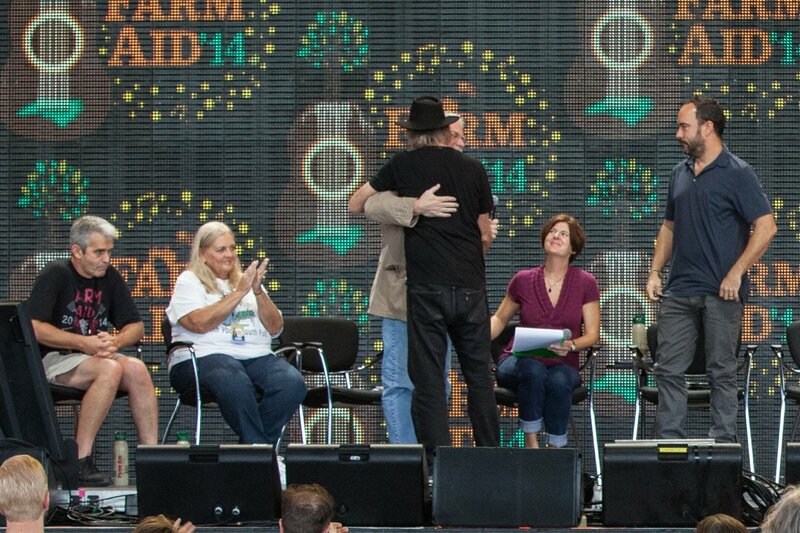 What Made Neil Young Hug My Boss? Our Executive Director Scott Marlow delivered a compelling statement at Farm Aid this past weekend, and we thought we’d transcribe some of it to share with you all. It moved Neil Young so much that he gave Scott a big hug on stage. Previous post The Deadline for Whole Farm Revenue Crop Insurance is Coming!